Intellectual virtues are developed through teaching, and moral virtues through habit. Moral virtues are not in our nature, but nor are they contrary to our nature, which is adapted to receive them. Sight and hearing are in our nature, and so they are given to us. In contrast, the arts and the moral virtues are not given to us, but are acquired through constant exercise. Just as a man becomes a sculptor by sculpting, so he becomes just by doing just acts, temperate by doing temperate acts, brave by doing brave acts. It is impossible to define virtue with any precision, as the goodness of a feeling or action depends on individual circumstances. However, just as strength is destroyed by a defect or excess of exercise, so the virtues are destroyed by their defect or excess. For instance, he who flies from everything becomes a coward, whereas he who meets with every danger becomes rash. In contrast, courage is preserved by the mean. Moral excellence is closely related to pleasure and pain: it is in pursuing and avoiding pleasure and pain that bad things are done and noble things not, and so it is by pleasure and pain that bad people are bad. There are three objects of choice, the noble, the advantageous, and the pleasant, and three objects of avoidance which are their contraries, the base, the injurious, and the painful. The good tend to go right, the bad wrong, about these, and especially about pleasure which is common to the animals and which is also found in the advantageous and in the noble. A good person feels pleasure at the most beautiful or noble (kalos) actions, whereas a person who is not good often finds his perceptions of what is most pleasant to be misleading. It is harder to fight with pleasure than with anger, but both art and virtue are concerned with what is harder, and even the good is better when it is harder. A person may do a seemingly virtuous action by chance or under compulsion. His action is truly virtuous only if (1) he knows that the action is virtuous, (2) he chooses to do the action for the sake of being virtuous, (3) his action proceeds from a firm and unchangeable character. In short, an action is truly virtuous if it is such as a virtuous person would do. But most people do not do these, but take refuge in theory and think they are being philosophers and will become good in this way, behaving somewhat like patients who listen attentively to their doctors, but do none of the things they are ordered to do. There are three things that are found in the soul, passions, faculties, and dispositions. As the virtues are neither passions nor faculties, they must be dispositions. In light of this, virtue can be defined as a disposition to aim at the intermediate between deficiency and excess, or, in other words, as a disposition to aim at the mean, which, unlike deficiency or excess, is a form of success and worthy of praise. While it is possible to fail in many ways, it is possible to succeed in one way alone, which is why the one is easy and the other is difficult. By the same token, men may be bad in many ways, but good in one way only. So far so good, except that not every passion or action admits of a mean, for instance, not envy or murder. 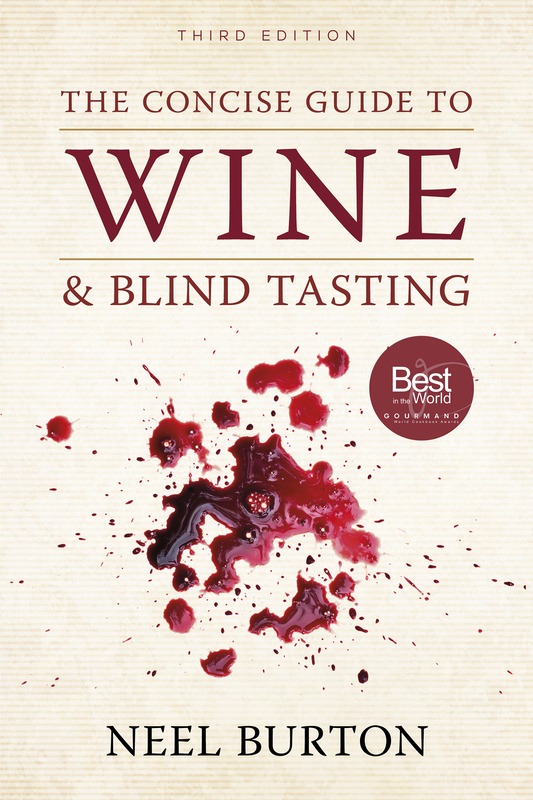 It is never a question of murdering the right person, at the right time, and in the right way, for murder is bad in itself and neither a deficiency nor an excess. 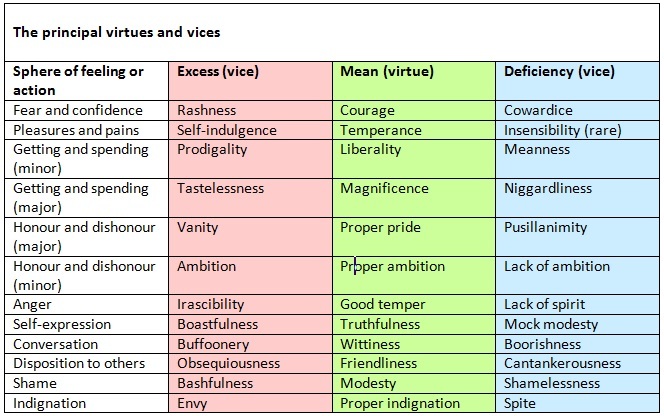 The principle virtues along with their corresponding vices are listed in the table. In some cases, one vice can be closer to the virtue than the contrary vice, for instance, rashness is closer to courage than cowardice, and prodigality is closer to liberality than meanness. This is not only because the first vice is more similar to the virtue than the contrary vice, but also because the contrary vice is the more common. Rashness is more similar to courage than cowardice, which is more common than rashness, and prodigality is more similar to liberality than meanness, which is more common than prodigality. Hence people oppose not rashness but cowardice to courage, and not prodigality but meanness to liberality. It is no easy task to be good. For a person to increase his likelihood of hitting the mean, he should (1) avoid the vice that is furthest from the virtue, (2) consider his vices and drag himself to their contrary extremes, (3) be wary of pleasure which clouds judgement and leads astray. The person may miss the mean by a little, for instance, he may get angry too soon or not enough, and still be praised for being either manly or good-tempered. It is only if he deviates more widely from the mean that he becomes blameworthy; how widely is difficult to determine, as it depends on the individual circumstances and on how they are perceived. For in everything it is no easy task to find the middle … anyone can get angry – that is easy – or give or spend money; but to do this to the right person, to the right extent, at the right time, with the right motive, and in the right way, that is not for everyone, nor is it easy; wherefore goodness is both rare and laudable and noble. Adapted from Aristotle’s Universe: A Primer on Aristotle.